Katherine Tegen Books, 9780062307774, 320pp. 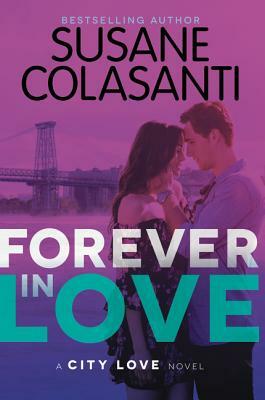 From bestselling author Susane Colasanti comes the bittersweet ending to the City Love trilogy, featuring three girls sharing an apartment in New York City the summer before college begins. Forever in Love captures the essence of summer love, self-discovery, and sisterhood, a perfect fit for fans of Sarah Dessen, Jenny Han, and Jennifer E. Smith. Sadie is trying to find the strength to confront a past family trauma and forgive the boy who broke her heart. Darcy needs to figure out how to make it on her own for the first time and finally accept the love she deserves. Rosanna's boyfriend might still be in love with his ex…and she can recognize the abuse of her past reflected in a girl who needs her help. As the summer comes to an end, will they learn to love themselves and support one another with a bond of sisterhood that will never be broken? Told from alternating points of view, Forever in Love celebrates three girls who will be forever in love with the endless possibilities their futures hold.